The former Northwest Division starter stepped into the position suddenly and unexpectedly in April 2016, at the Denso Sparks Plugs Nationals that’s coming this next weekend at The Strip at Las Vegas Motor Speedway. He served as interim starter in the wake of Mark Lyle’s fatal accident in the waters off Mexico during a vacation to celebrate his birthday and his anniversary with wife Marcia. The NHRA named Gittings the official starter – only its fourth in the sport’s history – May 5, 2016. 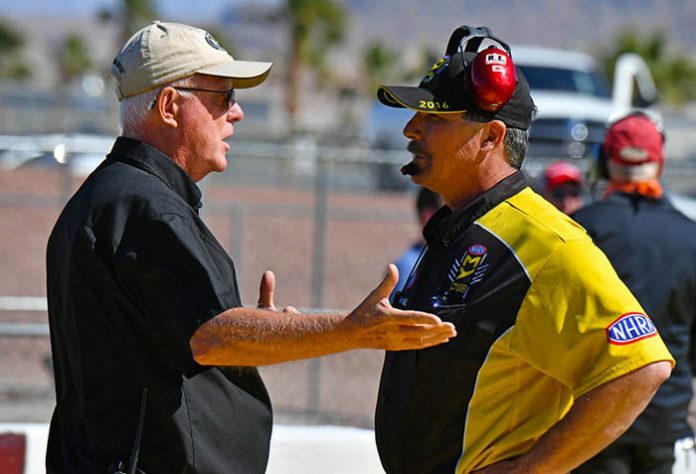 Then this Jan. 15, in what he described as “a call out of the blue,” Gittings was told the NHRA had decided to eliminate the official starter position. Actually, the NHRA still has an official starter, but the title is one of several that belong now to the tandem of Brad Hardy and Ron Heath. They are Safety Safari members who help prep the track and handle set-up chores at each race after driving the equipment trucks from one national event to the next. Hardy is responsible primarily for pro starting and Heath for sportsman starting, but the two are able and expected to substitute for each other. Hardy and Hatch will be the starters at every national event. All of this seemed shocking to fans and racers who accorded the utmost respect to Buster Couch (1955-96), Rick Stewart (1996-2011), and Lyle (2012-16) and then Gittings. And it certainly seemed puzzling to Gittings, who was preparing for another season at the starting line. “The last communication with who I consider my boss was on Sunday at Pomona [in November, at The Finals]. And I’d been trying all year long during the ’18 season to get a meeting and be able to talk to this person. Everything had gone great in ’18, I felt, other than I didn’t really agree with the track-prep call that was made for the pros but worked through that. That was one of my big concerns as a starter, safety on the track,” Gittings said. Gittings said, “They said it was strictly a business decision. And I immediately asked, ‘Did I do something wrong? Was there something I did incorrectly? Was it a performance-related decision?’ I was told no: ‘It had nothing to do with anything you had done or your work, strictly a business decision, and we’re going in a different direction.’ And I just kind of took it at that. I didn’t know what else to say. My main concern was that I didn’t do something wrong. Like everyone else who heard the news, Gittings asked straightaway how those responsibilities would be handled moving forward. “Of course, I immediately said, ‘How are you going to do this? What are you going to do?’ My mind was really just shattered at the time, because that position, to me – whether I’m it or not, to be clear – just needed to go forward. It was just such a huge part of NHRA,” Gittings said. He said, “They told me I’m more than welcome to continue to work for the division. They don’t have any hard feelings against me.” He said he could help out in Division 6 or work at the CatSpot Northwest Nationals event at Pacific Raceways in August. “But I just don’t know if I really want to. I’m just in a regrouping mode right now. “I’m just going to focus on my family and business. I have a business that I’ve been in for a long, long time that I always ran part-time and never really went at full-time. So that’s where my focus is now, to try to go at that full-time. It’s water-valve testing, backflow valve,” he said He has had the Washington State certification for more than 20 years to test systems in the area. “I’m 57, going to be 58 in May. I’ve got about four or five years before I want to pull my retirement. I’ll retire at 62, probably, and turn the page,” Gittings said. But the NHRA’s decision to use a new format for the starter’s position still weighs on Gittings’ mind. “I wanted to make sure people knew that I feel as badly as the fans do that they’ve chosen to take that position away,” Gittings said. “I’m not sure whose decision ultimately it was or how they came about that, but I wish that they had continued it, regardless of whether they had wanted someone to do it at a lesser wage to save money or whatever . . . I just really wish they had kept it going for the history of the sport. Go find No. 5. I was happy to be No. 4. I did the best I could. But go find No. 5. Were Lyle here, Gittings said, “I just think that he’d be disappointed in the decision, like I am. I’m disappointed in the upper management not realizing the importance of that position. I know there’s people around them who do.” He said he tried to be a faithful steward for the racers and for Lyle’s legacy. “In drag racing, you look for consistency. I tried to bring to it, and that’s what Mark tried to bring to it: a consistent, safe starting line. This one arguably might be the most unsettling for the sport’s longtime followers.